Marshawn Lynch: The President of Piping. Marshawn Lynch has done it this time. 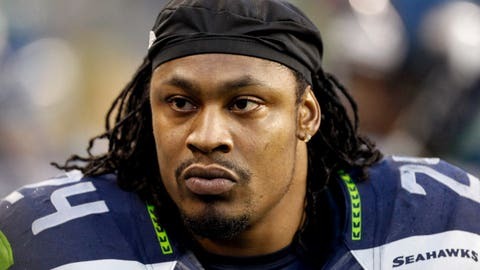 The Seahawks star is well known for his aversion to giving interviews. He has his reasons and people seem to respect that. However, that doesn’t mean he won’t knock out a commercial. That’s right. Marshawn has gone straight Beast Mode for a local Seattle plumbing company. Here’s the storyline: A young dark-haired mother who somehow has a blonde son is having multiple plumbing issues and places a call to Beacon Plumbing. Lo and behold, guess who shows up? Not a slightly overweight man with a toolbox and his pants riding low, no way. It’s none other than Marshawn Lynch! We then watch as Beast Mode pulls out what appears to be a soft dinosaur egg from the kitchen drain and then rips out a toilet. Welp, problem solved! Stop freakin’ and call Beacon! There’s nothing better than local commercials.